Please click on the images below to see full details of each available plot. Please note that ‘Reserved’ plots could come back on the market. The first image shows which plots are available. Here are two potential, stunning house designs, which have been created courtesy of NP Architects, Cambridge for plots on the tree belt side. 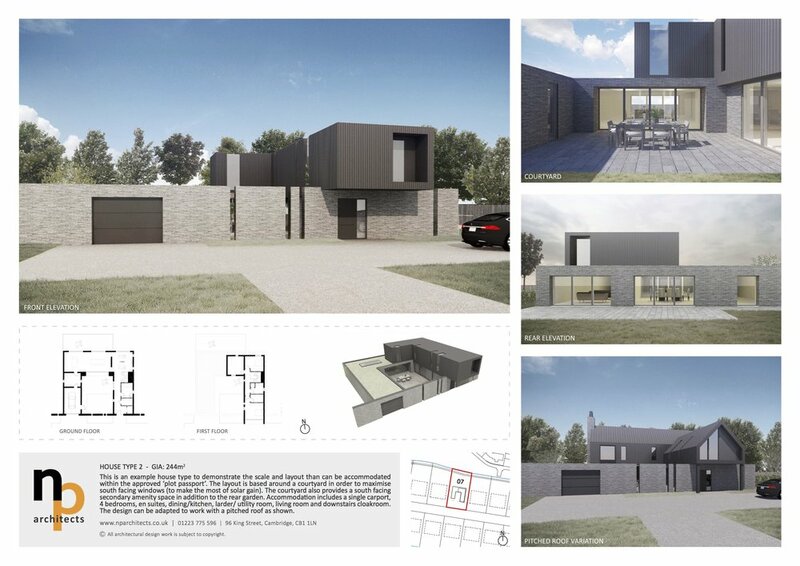 House Type 1 - This is an example house type to demonstrate the scale and layout than can be accommodated within the approved ‘plot passport’. The layout is based around a courtyard in order to maximise south facing windows (to make the most of solar gain). The courtyard also provides a south facing secondary amenity space in addition to the rear garden. Accommodation includes a double carport, 4 bedrooms, 2 en suites, dining/kitchen, larder, utility room, living room, downstairs cloakroom, and addition reception room/playroom. A double height space has been created above the dining area. The design can be adapted to work with a pitched roof as shown. House Type 2 - This is an example house type to demonstrate the scale and layout than can be accommodated within the approved ‘plot passport’. The layout is based around a courtyard in order to maximise south facing windows (to make the most of solar gain). The courtyard also provides a south facing secondary amenity space in addition to the rear garden. Accommodation includes a single carport, 4 bedrooms, en suites, dining/kitchen, larder/ utility room, living room and downstairs cloakroom. The design can be adapted to work with a pitched roof as shown.